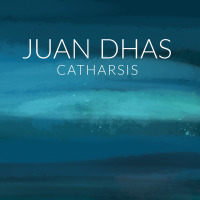 Guitarist Juan Dhas's full name is Juan Diego Chandra Dhas which gives some idea of his initial life influences through his Colombian mother and Indian father. 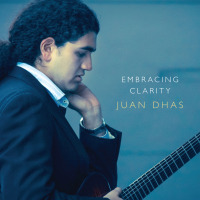 After getting a scholarship to the Berklee College of Music in 2010, and graduating in 2014, Dhas recorded Embracing Clarity, which is only available digitally due to financial constraints. Blessed with seemingly endless guitar technique in both hands (see here), Dhas can do whatever he wishes technically. However, on his seven original compositions he frequently underplays the technical and emphasizes emotion and story telling. Dhas and his highly sympathetic band (pianist Benjamin Furman, bassist Alex Gorchesky and drummer Aaron Lawson), all of whom participated in the arrangements, have created music that floats over an inner core of intensity and fire. The "clarity" of the album's title is immediately evident both in Dhas' guitar lines and the way the very tight band's individual parts fit together -and the sum is much more than the parts. The overall effect is very attractive and more than a bit mesmerizing, while the music seems to fly by as it ebbs and flows while always moving forward. There is a gloss and sheen to Dhas' music, caused partly by his physical guitar sound, but also by the ethereally ambiguous harmony that is many times coupled with a driving groove. Guiding the beautiful sounds and emotions is an intelligence which can be clearly sensed. As a début effort, Embracing Clarity is very impressive in that Dhas exhibits a distinct musical personality at such an early stage of development. From the musical evidence, he knows what he wants to say and how he wants to say it, and there is no doubt that Dhas will continue to grow, but always from this solid and joyful musical core -and it is this core which reaches out and touches. Track Listing: Free; Motive; Premonition; Light in the Dark; Wired; Let Go; Andean Sky. Personnel: Juan Dhas: guitar; Benjamin Furman: piano/keyboards ; Alex Gorchesky: Bass; Aaron Lawson: drums . .